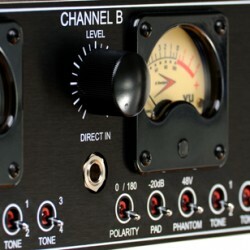 The MP-2A is a true tube-in, tube-out stereo microphone preamp based on the celebrated MP-2 from A-Designs Audio. The new “A” series has many modifications incorporated from the original MP Series. Some of the newer features include a -20dB Pad Switch, selectable tone switches, which allows you to create 4 different tones per channel. 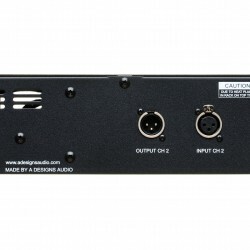 Also, the new output gain standard of the MP1-A and MP-2A Series is now 60 dB! Perfect for the new generation of Ribbon Microphones. Utilizing world class input transformers by CineMag and custom designed output transformers for the lowest noise level and highest quality sound, the MP-2A brings the warmth and richness of analog to your recordings while maintaining a crystal clear spectrum of sound. 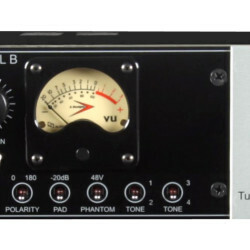 The MP-2 is a professional class preamp for use on a variety of sources, and includes rear panel instrument and front panel line level inputs. It delivers warmth, transparency, and a quality sound with a clean and airy high end like only a high quality all-tube pre-amp can.